Treatment of patients with a brain tumor remains one of the most challenging and difficult areas of modern oncology. Recent advances in the molecular biology of these neoplasms have improved our understanding of the malignant phenotype and have lead to the development of novel forms of chemotherapy, including “targeted” agents. 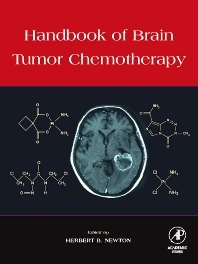 The Handbook of Brain Tumor Chemotherapy reviews the state-of-the-art of chemotherapy development and clinical treatment of patients with this devastating disease. Neurosurgeons, neuro-oncologists, oncologists, neurologists, and oncological researchers with an interest in the development and application of chemotherapy to brain tumor patients. I. Pharmacology and Clinical Applications. Overview of Brain Tumor Epidemiology and Histopathology. Clinical Pharmacology of Brain Tumor Chemotherapy. Chemotherapy and Anti-Epileptic Drug Interactions. Brain Tumor Models for Cancer Therapy. Microarray Analysis and Proteomic Approaches to Drug Development. Clinical Trial Design and Implementation. II. Molecular Biology and Basic Science. Regulation of the Cell Cycle and Interventional Developmental Therapeutics. Growth Factor Signaling Pathways and Receptor Tyrosine Kinase Inhibitors. Ras Signaling Pathways and Farnesyl Transferase Inhibitors. PI3-Kinase, PKB/Akt, mTOR, and Internal Signaling Pathways. Tumor Invasiveness and Anti-invasion Strategies. Mechanisms of Angiogenesis in Brain Tumors and their Translation into Therapeutic Anti-tumor Strategies. Biology of the Blood-Brain and Blood-Brain Tumor Barriers. III. Innovative Approaches to Chemotherapy Delivery. Interstitial Chemotherapy and Polymer-Drug Delivery. Intratumoral Administration and Convection-Enhanced Delivery. Marrow Ablative Chemotherapy with Hematopoietic Stem Cell Rescue. CSF Dissemination of Primary Brain Tumors. IV. Chemotherapy of Specific Tumor Types. Chemotherapy of Primary Central Nervous System Lymphomas. Chemotherapy of Pineal Parenchymal Tumors. Current Therapeutic Management Strategies for Primary Intracranial Germ Cell Tumors. The Role of Chemotherapy in Pediatric Gliomas.